Windows 10 hasn’t been quite as successful as Microsoft once hoped, with the company’s newest and most important operating system so far failing to achieve its aggressive growth path to a billion users by 2018. Nevertheless, with Windows 10 exceeding 400 million users and with a robust PC ecosystem, it’s not all bad news for Microsoft. 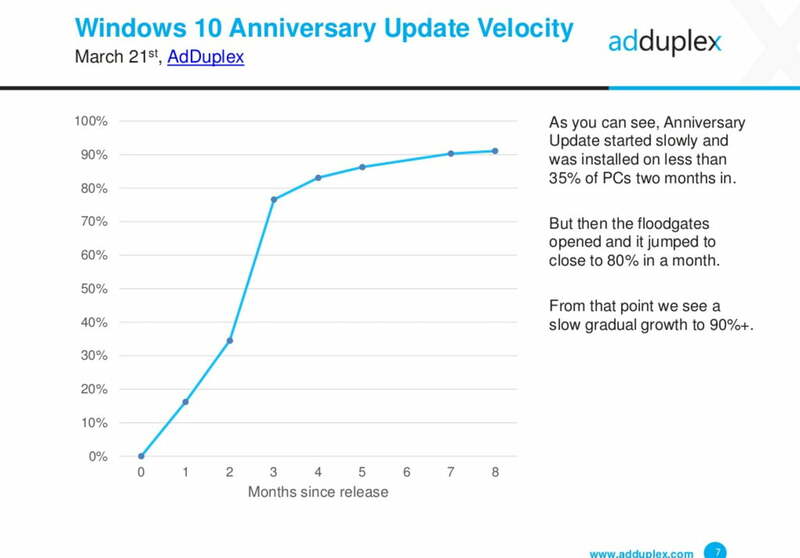 The latest data from AdDuplex, which assesses the machines that run Windows Phone and Windows 10 apps utilizing that company’s ad network, provides some additional detail on how the Windows 10 market is shaking out. Specific emphasis was placed on how quickly users are upgrading their Windows 10 machines and which PCs are dominating the ecosystem. Perhaps the best news for Microsoft that can be pulled from the data is the strong presence of Windows 10 Anniversary Update. With Creators Update right around the corner, the company should be pleased that more than 90 percent of Windows 10 users are running Anniversary Update, also known as Windows 10 Version 1607. 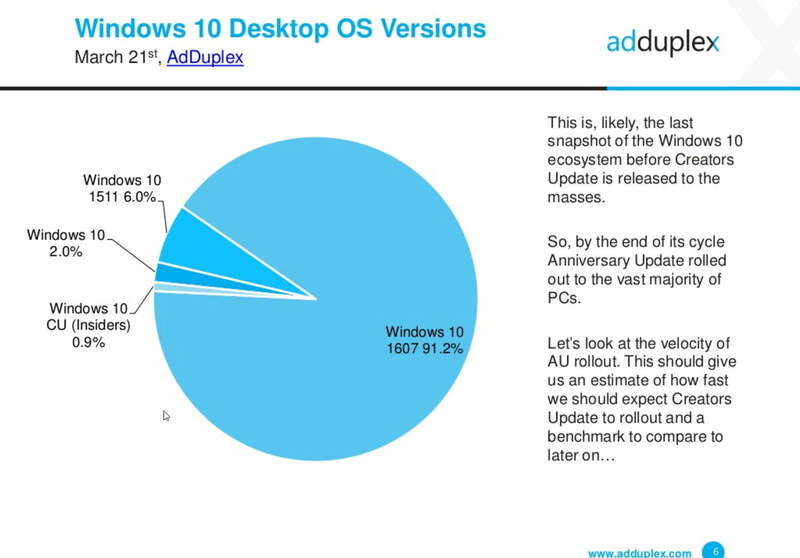 According to AdDuplex, the Windows Insider group comes in at only 0.9 percent of Windows 10 users, which means that the users providing feedback on Windows 10 preview builds represent only a sliver of the overall population. For anyone who wants to predict how quickly Windows 10 Creators Update will roll out, perhaps Anniversary Update’s velocity provides a clue. If history repeats itself, then most users will give Microsoft time to work out the bugs before updating, at which point the numbers will jump dramatically. 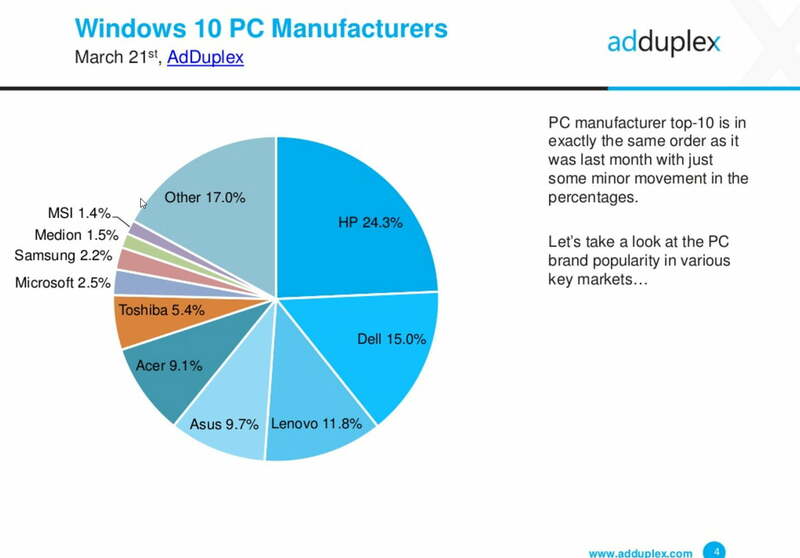 In terms of which manufacturers are dominating the Windows 10 ecosystem according to AdDuplex, the numbers shouldn’t come as any surprise. HP comes in first place with 24.3 percent of the market, with Dell in second at 15 percent and Lenovo holds onto third place at 11.8 percent. While Microsoft’s Surface line gets a great deal of the press, its market share remains low overall at 2.5 percent of Windows 10 machines. Finally, according to AdDuplex, the Surface Pro 4 remains the top seller among Microsoft’s Surface line of Windows 10 machines, representing 34.4 percent. 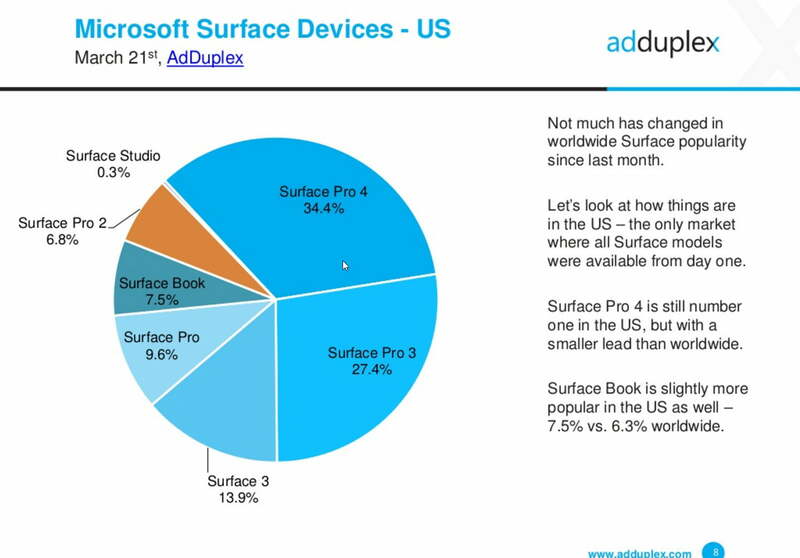 The Surface Pro 3 remains in a strong second place position at 27.4 percent. Microsoft’s pricier Surface Book holds 7.5 percent, while the ultra-expensive and niche Surface Studio has only grabbed 0.3 percent of Surface users. Microsoft will possibly be making the news soon with new Surface machines, specifically a second-generation Surface Book and then the highly anticipated Surface Pro 5. With Creators Update set to release on April 11, the Windows 10 ecosystem should remain of interest for the foreseeable future.